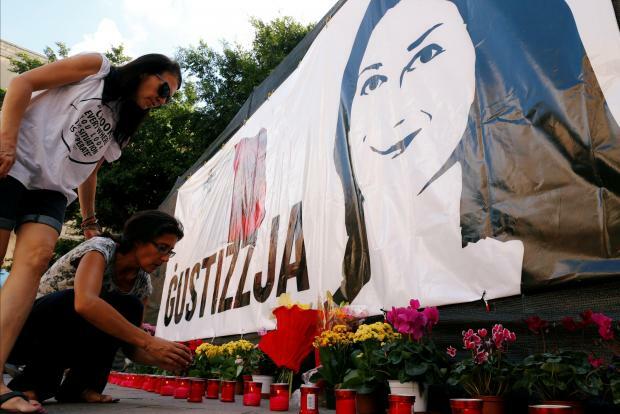 An ongoing battle between activists and authorities over using the Great Siege monument site as a memorial for slain journalist Daphne Caruana Galizia flared up on Saturday, with activists filing a police report after government workers cleared the site. 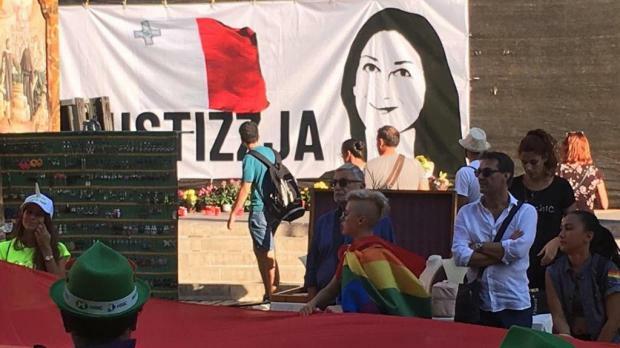 Activists had erected a banner in memory of Ms Caruana Galizia on Saturday morning, one week after the monument was blocked off with hoarding for what the Justice Minister described as “health and safety” reasons. Campaigners defied the measures taken to block off the monument as they prepare to mark the 11th month since the journalist's assassination on Sunday. They placed a banner with the word 'justice' along the image of the late journalist's face. Their actions were not taken lightly by a group of hecklers in Valletta who accused them of going too far. The activists handed them leaflets citing constitutional references to freedom of expression, which the objectors immediately dumped in a bin. Within hours, the banner and candles which activists had put up at the blocked-off site joined those binned leaflets. Shortly after 2pm, Cleansing Department workers wearing high-visibility vests made their way to the site and took down the banner. According to blogger Manuel Delia, the workers also swept away candles and flowers placed at the site. Mr Delia immediately filed a report at Valletta police station. In a statement to the press, he said that police told him they saw nothing illegal with the memorial site. He thanked Valletta police officers for their help and urged them to continue to protect legitimate protests. By 5pm the banner was back, minutes before the annual Pride parade came sashaying through Republic Street. Activists have now urged volunteers to help them guard the memorial site throughout the night, ahead of Sunday's anniversary vigil. "Is it now extremely evident that our freedom of expression is being blatantly suppressed," said activist group Occupy Justice. "This has basically become an issue of health and safety of our democracy." Later, journalists' lobby IĠM slammed a public sector official who harassed a journalist who was filming workers removing the banner. The worker should be investigated and disciplined, the IĠM said. Activists have for the past 10 months used the monument as a memorial site and a symbolic call for justice opposite the law courts for Ms Caruana Galizia. The monument was sealed off last Saturday to allow restoration on its base, a move widely viewed as the government’s latest attempt to put a halt to the site being used for memorials and protests. Hoarding and barriers were initially used, although the barriers were not there on Friday. Activists assemble by the monument on the 16th of every month to mark the anniversary of Ms Caruana Galizia’s assassination on October 16 last year. 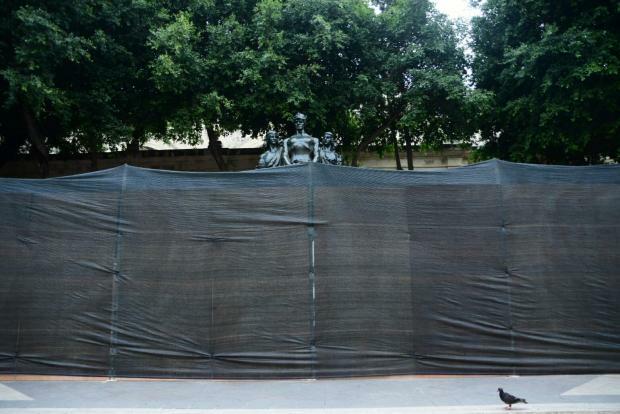 Minister Owen Bonnici said, when asked why was a public space cordoned off, that the area around the monument was now a work site. Restoration workers needed an environment that was free of obstructions to carry out the necessary work on the monument, he said. “It is basically an issue of health and safety of the workers,” he said. Asked when the restoration works were expected to begin and how long they would take, the minister replied they would start immediately and that the Grand Harbour Restoration Corporation was roped in to carry out further works to improve the aesthetics in the area around the monument. The banner was back in place as this year's Pride parade rumbled past. Questioned if steps would be taken after the restoration job to prevent the site being used as a memorial, Dr Bonnici said he had tried to be “as cautious as possible” with his words. “I have not said someone damaged the monument. I said, unfortunately, the monument has been damaged and I appeal for reason,” he remarked. Dr Bonnici appealed for the monument to be taken care of once it was restored. He felt it was crucial such an important site be restored and remain in a good state of repair because it meant a lot to different people. The monument was last restored by Din l-Art Ħelwa in 2010. Din l-Art Ħelwa president Maria Grazia Cassar said last week she found it odd that the monument was being covered with hoarding as Valletta was marking its last leg as European Capital of Culture. The area around the monument was covered last week.